The league released their All-B12 team already, I was surprised to see that they did so before the B12 championship game evidently counting that strictly as a postseason event and unrelated to the B12 season. Obviously there’s some sense in that but I wanted to see how the Red River Rematch played out before I made my own picks. Unlike the Big 12, who chose a first team TE and FB in order to cram seniors they wanted to acknowledge onto the team, I have my own positional designations designed to try and really reflect how the game is played in this conference. Here’s my preseason picks for reference, let’s go ahead and get started. I definitely underestimated Murray in the preseason. I had a few big suspicions about him, namely that he’d be contact shy and that he’d struggle to read defenses and recognize where to go with the ball. I was right about both of those concerns, but it didn’t really matter. He’s untouchably quick and teams had no idea how to play Oklahoma this season, often deploying rope a dope strategies that saw them take body blows for only a couple of rounds before dropping the gloves and yielding knockout punches. Kyler Murray is like a mini-Vince Young, able to hit throws with accuracy all over the field and physically dominant such that containing him and preventing him from generating explosive plays with his legs is so difficult as to often result in LONG periods of having a clean pocket and easy pre-snap reads. Some of that was generated for Murray by Lincoln Riley but a lot of it came from his own outstanding physical ability. By the end of the year he was growing increasingly comfortable in the offense as well and hunting mismatches before throwing dimes. The question with Kyler Murray is now “how great is he, exactly?” He has a chance to end up very, very high in the historical All-B12 QB discussion with these playoffs. Sam Ehlinger sandwiched a new record for most passes thrown by a B12 QB without an interception between two weaker games (that included some INTs that weren’t all on Ehlinger). He also added 591 rushing yards and 13 rushing TDs that Grier’s defendants keep ignoring in the comparison. There wasn’t a game this season in which Ehlinger’s play did anything but boost Texas’ chances of winning and had he the ball last in their losses to OSU and West Virginia then Texas probably wins those games. He’s like a marriage of Steve Worster and James Street into one person, the downhill FB that made Darrel Royal’s Wishbone go and the savvy, decision-making QB that distributed the ball properly on the option. Iowa State had a shot at playing in the Big 12 championship game with a run-centric offense because David Montgomery is nearly impossible to tackle. My man probably had to break at least 100 tackles to rush for 1k yards this year and he regularly kept the Cyclones on track with short positive runs that should have yielded nothing and forced teams to commit numbers to the run that would have been better served triple-teaming Hakeem Butler. Once Bill Snyder realized that his best run game weapon, and offensive weapon, was Alex Barnes then K-State tasted a lot more success down the stretch. Barnes is a fantastic power back with enough speed to hurt you if he hits a crease and the safeties aren’t there. He finished the year with 1355 yards and ran hard over the back half of the Wildcat schedule. Justice Hill was good again but he couldn’t stay healthy over the whole season and was missed in some big games. Oklahoma, OSU, and Texas all had some young backs flash big potential for the future but none of them are ready yet to do what Barnes or Montgomery did this year. Wesco was wide open on the vasty majority of his 24 catches this season because you were always too terrified that he would run you over to worry about the eventuality that he might blow by you on a route. Beck allowed Texas to actually run the Tom Herman run game this year, utilizing tight zone, power, and other schemes because their TE could actually block DEs. Sam Ehlinger missed Beck on a fair few POP passes this season (many dropped) and hit him on some others, he’s probably a better overall receiver than Wesco but not as good of a blocker and not a good enough (or used enough) receiver to make up the difference. Texas did use him all over the place though to help get Lil’Jordan Humphrey isolated in the middle of the field. 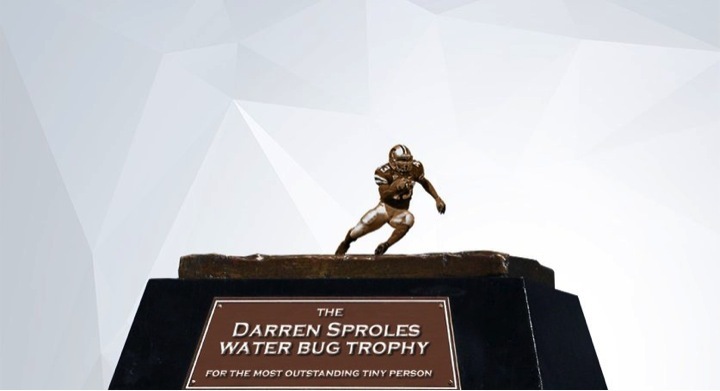 Ladies and gentlemen, announcing the winner of the 2018 Darren Sproles water bug trophy for most outstanding tiny person………………………………………. Brown battle what could be considered inevitable injuries to catch 75 balls for 1318 yards and 10 TDs. Combined with Kyler Murray he made Oklahoma one of the most explosive teams that college football has ever seen. If Brown returns next season he has a shot at doing something that’s never been done before and winning the award for three consecutive years. Kavontae Turpin really blew it here, but Pooka may have had him anyways. The Jayhawk RB ran for 1k yards at 170 pounds this year and added 289 receiving as well. Even if Brown returns there’s a shot that Pooka overtakes him for MOTP. Shout out to Ja’Deion High who did good work at Texas Tech this year and puts up bigger numbers if Alan Bowman had stayed healthy. This is my term for the guys who play between the hash marks a lot and serve as chain-movers for their offense. They may be explosive players but they’re primarily guys who are getting the third down targets rather than the guys who are throwing shots. Humphrey is a de-facto flex TE at 6-4, 230 pounds with blazing lateral quicks. One of Texas’ favorite strategy this year was to run 4-verticals with Humphrey tagged to run an option route at the sticks and then Ehlinger throwing him the ball at his route break. Another was to throw Humphrey a tunnel screen and watch him pick up 10 or so yards before getting caught only to refuse to stop fighting until his OL had arrived and carried him on a palanquin for another 10-15 yards. Texas ran a QB power on the next play (4th and 2) for about seven yards and a first and later scored on this drive. While David Sills V was a favorite target for West Virginia, Gary Jennings was their main answer for third down and a big part of what made West Virginia efficient on offense this year. He also had a big day feasting on Oklahoma’s freshman safeties in the season finale. Jalen Hurd of Baylor missed out here because he had a knack for getting the dropsies in big moments. Dillon Stoner of OSU was another guy that had a solid year. You could almost count CeeDee Lamb in this regard but he did more than this and lined up outside. Grant Calcaterra is another option here but he wasn’t yet at that level in the Oklahoma WR hierarchy, instead stuck behind Lamb and Marquise Brown and getting occasional important action. If Brown departs look for Calcaterra to be a featured weapon next year. This is the guy where teams hope to get him in man coverage and then, when they do, are throwing him the ball down the field. I’m trotting out a 12-man first team All-B12 because most ever team has both an ancillary and a fourth WR that are co-starters. These guys are the main thrust of offenses, we should have fewer RBs on the All-B12 list and more WRs. These were the two most terrifying guys in conference play. Butler is fast but he’s also just massive, has phenomenal body control and hands, and is way too physical for most guys to handle. Even the 6-0, 208 pound Kris Boyd struggled to move him off the exact path he wanted to take on routes. Butler had just 51 catches that yielded 1126 yards and nine TDs. Look at the inside break on this route and how he changes direction like he’s controlled by a joystick to finish the play with a score. A pair of 200-yard receiving games put Wallace at 79 catches for 1408 yards and 11 TDs on the year. Worth noting that Butler only had Brock pump fake Purdy throwing to him for about half the year and Tylan Wallace had to track down Taylor Cornelius’ inconsistent lobs. This is maybe the hardest choice of the entire list. Wesley was absolutely dominant this season, no one was covering him at all without a double team and he hit 88 catches for 1410 yards and nine scores while sharing the field with a lot of other talented wideouts and three different QBs. Jalen Reagor was quietly dominant this season despite also playing with three different QBs and managed to get to 1k yards receiving while helping drag the Frogs to bowl eligibility. CeeDee Lamb and Collin Johnson were both great, they didn’t have quite the same roles as these guys but often were regarded as the no. 2 or 3 threats on their teams. David Sills was excellent at attacking teams from multiple spots but he could be taken away by a physical DB in a way that these other guys couldn’t be. If you had Sills, Lamb, and Johnson on your team you’d expect to win the B12 title easily. Just a lot of amazing wideouts this year. Tough season for picking LTs, in previous seasons everyone always put their best overall OL at this spot. This year a lot of the better OL in the league played RT or inside, lots of guys got dinged up, and the best-pass-rushers in the league often didn’t come from this direction but inside or off the right. All that said, Bobby Evans was the most consistent in the league as a protector and run blocker. A narrow victory over Texas’ Calvin, Cajuste was one of the more talented left tackles in the league but didn’t always show it because of injuries or thrown punches. Hakeem Adeniji had a good year as well at Kansas but they’re a mess and didn’t show case him terribly well. Kansas hilariously had some of the best individual talents in the league this year and were still terrible. We’ll hit on some others later on. Texas’ Calvin Anderson was also very solid but probably played the second half of the season at 275 or 280 and with injuries that made things hard on him, particularly when teams threw bigger DL at him. I think 2019 will have a stronger crop here. You could make a case for just putting Oklahoma’s OL as the entire first team unit. They all played great football this year and ironically Bobby Evans was probably one of the less impressive (not unimpressive) of the starters, all things considered. I’ve liked Keyes each of the last two years, just a consistent performer that gets low in the run game and knows his assignments in protection. Josh Sills of West Virginia is another guy here who was solid but also moved around to multiple positions, ditto Julian Good-Jones of Iowa State. Patrick Vahe of Texas was solid here. Most teams had good not great LG play in 2018. There’s also a lot of guys around the league that will play LG at the next level. It seemed in the offseason as though Texas might replace Shack, who’d topped out as “solid” as a freshman and sophomore starter. Instead, he turned his first healthy offseason and chance to work with Herb Hand into an opportunity to make a leap. Next year Texas will count on Shack to execute zone combos with some up and coming talent in hopes of unleashing a sophomore Keaontay Ingram. Adam Holtorf of K-State also had a good season. A talented senior with some tackle-level athleticism that Oklahoma molded into a counter-blocking machine over the last few years and a really good pass protector as well. Oklahoma’s consistency of having Powers and Samia at guard for the last few years is hard to overstate. If/when Matt Campbell has two or three Knipfels on his OL then Iowa State could win the Big 12. Jack Anderson of Texas Tech is going to have fun next season in Matt Wells’ power and counter schemes. Elijah Rodriguez was very solid for Texas. Dalton Risner scrapped all season long for K-State and looked to maul people in the run game at every opportunity. Hard to knock him down given how well he played against run and pass and how hard he fought to send Bill Snyder out on a high note. Cody Ford is probably a guard in the NFL but an excellent one with great athleticism and the right disposition for run blocking. He was arguably the best OL for Oklahoma this season, it’s just that they utilized him at the most loaded OL position in the league. Texas’ Sam Cosmi was really close here for me, really, really close. He’ll be first team preseason LT next year in all likelihood and is as talented a RS frosh for his position as Creed Humphrey. Lucas Niang of TCU was also solid. It’s possible that Cody Ford or Sam Cosmi are the best OL in the league but that’s the rub when nearly everyone in the league has great RT play. Arguably the best defensive player in the league in a year that didn’t feature many truly good defenses. Omenihu split his time between the 4i-technique strong side DE spot and then some time on the edge on third downs. He had 16 TFL and 9.5 sacks and will draw a favorable rating for the 2019 draft. Hubert showed up big this year and replaced Kyle Ball as the LDE and ended up playing some 3-technique on passing downs as well. Very active guy with 7.5 TFL, 4.5 sacks, and an INT. I think next year he’ll blossom as a RS sophomore. Eli Howard of Texas Tech had another solid season but lost out his spot to Hubert. I was never impressed with Kenneth Mann of Oklahoma, no wonder they tried to get that Notre Dame grad transfer to replace him. Iowa State had like three guys they played in this role that were really solid this season. Look, the Wildcats played this guy at nose or 3-tech, whichever spot was more likely to get some action, and he made that spot tough to run on. His stats don’t tell the story of a season spent keeping LBs clean, getting avoided, and being paired with less talent up front than he needed to break free more often. Lima missed some games but for my money was the next best guy inside. Nevill Gallimore was good at times for Oklahoma, just not consistent. Broderick Washington for Tech and Chris Nelson for Texas were both good at creating pile-ups and causing some problems down low. Kenny Bigelow was a really helpful addition for West Virginia but short of being consistently dominant. This one is pretty easy, Wise moved around a bit this year and helped keep Dineen clean while also inflicting 12 TFL and five sacks. Lynch is one of the most important pieces to the puzzle for Matt Rhule’s 2019 Baylor Bears. They moved him around to strong side end or nose tackle, basically where they needed him to anchor the point of attack, and he was really effective with 8.5 TFL and 4.5 sacks. He’ll be their Matt Ioannidis next season. This was a narrow victory over Corey Bethley who had a great year but did a lot of his damage stunting around next to Ben Banogu. Amani Bledsoe flashed big time play at times only to disappear at others, like many other Sooner DL he needs to build strength. I hold Banogu, and to some extent his partner on the line Corey Bethley, chiefly responsible for TCU fielding another solid defense and helping Gary Patterson figure out how to get to six wins on the year. He’s explosive on the edge but maybe even better at timing stunts inside that work against the run or the pass. Life next year without him could be tough in the Fort. The Cowboys only sorta used Brailford as an edge-rusher, also regularly crashing him inside as a spinner, slanting inside from the edge, or taking on the first responder in pass pro only for Cal Bundage to follow him from the edge and come free. Still, it was a productive season for the senior and it was promising for OSU that Jim Knowles had some good ideas for how to get him into the backfield. Jaquan Bailey was also very good here for Iowa State, Jarell Owens and L.J. Collier did some stuff opposite these guys, and Charles Omenihu was probably the best edge-rusher in the league when he wasn’t holding things down inside. Shout out to Ronnie Perkins of OU as well, who could be the class of the league here in 2019 with a good offseason. This is a new positional designation to denote guys that have the versatility to drop into coverage but will also regularly come charging at the line of scrimmage to try and cause disruption. Basically OLBs although they may play as a nickel or other position. These days teams use different positions for different roles so I want to capture the role rather than out of date positional designations. Long improved this year and the Mountaineers shot him into the backfield a lot, relying on his short area explosiveness and high motor to try and kill plays for them this season. 94 tackles, 19 TFL, and seven sacks speaks to a season of quality disruption. A faster Long with worse finishing moves, Johnson played in Texas’ shock trooper position the “rover” and had 85 tackles, 15.5 TFL, and five sacks. Other guys that contributed in this role at a solid level include Willie Harvey of Iowa State, Ty Summers of TCU, and Cal Bundage of Oklahoma State. For this role we’re talking about guys that mostly play as traditional “read flow, beat blocks, make stops” guys in the middle of the field. Not a great year for these guys. Dineen is in position, someone else loses their gap, Dineen cleans up. Still, a very good player that also made his share of tackles at the line when everyone else was in position. Dakota Allen was as good as anyone but missed too many games to injury to get first team and could have also missed second team if I’d found a more worthy option. Garrett Wallow of TCU was good but rotated a lot and didn’t play strictly as an inside-backer. OU’s Kenneth Murray and Curtis Bolton were solid but not spectacular. ISU’ Mike Rose flashed a lot but isn’t up here yet, Baylor’s Clay Johnston and OSU’s Justin Phillips also just missed the cut. Hard to separate between all those guys. Part-time linebacker, part-time coverage defender. You could almost throw Harvey in here as well although he played more on the edge and the blitz than Spears. Iowa State’s ability to drop their OLBs back and deny in-routes and bracket guys in coverage was phenomenal this year and a big part of their success. Obviously Spears was a major piece of the pie. We’re rolling with a SportsTreatise favorite here. Playing as the Mountaineer sam LB, Stewart had 9.5 TFL and three sacks and gave them some explosiveness on the perimeter. They asked him to blow up blocks by OL all year down in the trenches and he held up pretty darn well. Clay Johnston had to do some of this as well for Baylor in their Tampa-2 stuff, of course it wasn’t effective. Texas’ B.J. Foster could factor here next season, this year he wasn’t quite good enough. Caleb Kelly nearly snuck in here with his performance in the second half of the season. Everyone needs a safety in this league that can sit on a hash or shallower and get involved in stopping the run as an overlapping fit player or even an interior gap defender. Otherwise you’re just going to get spread out and then run over. Eisworth spent the season as a free-hitter against the run and most teams really struggled to figure out how to avoid him erasing runs. He ended up leading the Cyclones with 84 tackles and was an enforcer over the middle as well. TCU’s Ridwan Issahaku gets a mention because he was healthy and consistent all year, moving back and forth between weak safety and strong safety in different packages and to shore things up when the superior Innis Gaines went down. Robert Barnes was decent here as well but didn’t play enough of the season. Kennth Edison-MacGruder was alright. Texas’ defensive strategies this season leaned heavily on playing Jones down in the box and Kris Boyd on an island on the left side in order to get enough good tacklers in the box to stop the run. He was excellent but missed a few games, including the crucial loss against West Virginia when Texas couldn’t stop the run. Still had 66 tackles and 5.5 TFL on the year and is first or second team with a healthy season. Iowa State’s Braxton Lewis also served here some this season and was good in the run game. For my money, Robinson was probably the hardest guy to beat over the top in the league. He had 75 tackles cleaning up from the deep middle and three INTs along with four break-ups defending the posts and digs that everyone throws over the middle in this league. Very mixed season for “the wolf of DKR” but Texas asked a lot of him this year as a true freshman and he finished it with 62 tackles and four INT trying to support over the top, mostly from the deep middle. He’s the most talented support safety in the league but he didn’t really put it all together in year one. Normally TCU has a guy here but they did not this season. Either a nickel or a strong safety that gets asked to match up on good slot receivers in tough covers in the middle of the field. Dorsey exemplified what Tech did well on defense this year, disguising his coverage alignments, matching up on slots in man coverage, and picking off four passes while bringing confusion to QBs about where the ball should go. Dravon was okay, this position had a down year around the league. Innis Gaines did this some and went down, Oklahoma’s defenders in the slot were terrible, Texas’ P.J. Locke was solid against the run but vulnerable against the pass unless he had real help. Tre Norwood played this spot in the B12 title game at a high level but not in the regular season. Pretty easy call here. Boyd and Peavy were the only guys in the league who consistently played on islands all year and held up without getting devastated every week. Boyd had some troubles with speed guys like Reagor, Wallace, and Brown but also had big days on Sills and Butler. Peavy is really solid in coverage, really solid against the run, and freed up Braxton Lewis to regularly bring an extra hat against the run and keep QBs guessing about what type of two-high coverage they were getting on that snap until it was too late. A.J. Green was probably the next best guy in the league for trying to cover someone on an island without help. Davis was pretty good in coverage but he’s also on here because he utilized his 6-2, 205 size to play excellent cloud coverage on the perimeter and allow Texas to send their nickel off the edge against the run and yield space for screens because he could beat blocks and force the ball in to pursuit. Adrian Frye picked off five passes and has a bright future but I don’t know about the down to down consistency from the freshman. Maybe one day OU will have a bunch of players mentioned on the defensive side, too. Good write up Ian. Always enjoy your All Big 12 team. I will add that as a Sooner fan…the fact that Lamb didn’t make the team shows how deep the league was in WRs. Interesting list as always. Nice to see I actually predicted something write as I told you last year Cajuste would be on the list. You have any thoughts on his counterpart on the right, McKivitz? He tends to get props from PFF and the like. Sills’ catch rate was horrible this year and he probably cost us the OSU game with his drops. I’m glad you rightly recognized the better WVU receiver, unlike the conference. I was curious where you would rank Long given what you’ve said about him in the past. All in all, no arguments from me. I hope he comes back, he is awful small to declare early. Man, 4 defenders on your all-conference team and WVU still had a defense that couldn’t get a stop in the last two weeks. I want to give Gibby another year, a lot comes back, but this turned into a pretty disappointing showing on his side of the ball this year. OU has often had some of the best individual defenders in the league but crappy overall defense. Texas wasn’t all that great on D this year, all things considered, despite having the best DL and CB and also having some stars at S and LB. I didn’t think Cajuste would hold up considering how many great players usually end up at LT but he did, partly because they were all at RT. Long was improved this year and definitely disruptive. I think he turned out better than I expected, mostly because he was better than last year. Sills was pretty great but teams eventually figured out you have to be really physical with him and who knows? Maybe he had some injuries late that hurt him. He’s really strong down low but also kinda skinny up top and Boyd was able to move him off his routes and slap the ball. McKivitz seemed solid to me. This is a good list. It’s tough because when I watch Big 12 games during the year, I’m not really watching individual players too much. I do notice individual guys more in the Baylor games I watch more closely, though. Ehlinger at 2nd team is almost surely right this year, though I’ll take Purdy over him starting this next year. Justice Hill was seemingly surpassed by Chubba late in the year. If both Montgomery and Barnes leave, I wouldn’t be surprised if Hubbard is a All Big 12 guy next year. Stud. I don’t know enough about Hubert. Greg Roberts from Baylor turned into a really good player by the end of the year. In 9 games he had 8 TFL, 3 sacks and 2 PD. May as well give Hubert the tie since he’s younger. Scuttlebutt from Baylor coaches was they would have killed for another year with Roberts, he’s the kind of big, long DL they are recruiting now. Great that you recognize James Lynch. Best Baylor DL I’ve seen. I was never impressed with Malcolm Rodriguez, but there aren’t a lot of options here in the big 12. Ditto with Dorsey. Specifically in the Baylor game he got worked a bit. But safety is a position that’s hard to judge from afar so I’ll trust you on these. Oh and, you know tons more about Davante Davis than I do, but I have never been impressed. When Baylor’s Derrek Thomas was healthy in the back half of this year, he was a total stud. I think he’ll blossom in the NFL after being a 5th round pick or something. Totally clamped down on Hakeem Butler and Antoine Wesley playing bump and run. Well I may have just missed it. It was exhausting trying to make this list. I don’t know how you do to class recaps. I cover the Baylor one for ODB and by the end of it I cannot stand even thinking about being on HUDL any longer. You may have noticed that it takes me an awfully long time, haha. Yeah, I agree w/r/t Dorset. I think Ian may have just happened to catch his best game against OU. It was a tough call trying to find guys for that slot. I wouldn’t be shocked to learn Dorsey is the wrong call but I’d love to hear some alternatives. Thanks for this, Ian. Would it be possible to put their class next to their names (Fr, So, Jr, Sr)? Helps in seeing who could come back next season for each team.